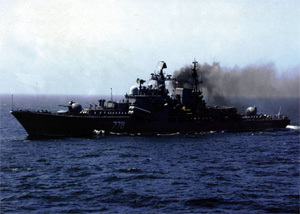 Burniy is a Project 956 destroyer. The ship was laid down on November 4, 1983 at Zhdanov Shipyard No. 190 (now called Severnaya Verf) in Leningrad; launched on December 30, 1986; commissioned on November 9, 1988. In October 1999 the ship attended 50th anniversary of People's Republic of China in Shanghai. On Apr 10, 2000 at 10 am the ship performed an unauthorized artillery fire at the board of large ASW ship Admiral Vinogradov. In Aug 2005 a sailor disappeared from the ship during the cruise from Vladivostok to Qingdao, China. Reportedly, the radio operator did not return from the leave. Since 2005 the ship has been under repair at Dalzavod Shipyard in Vladivostok.